The bold, the beautiful, the retro. 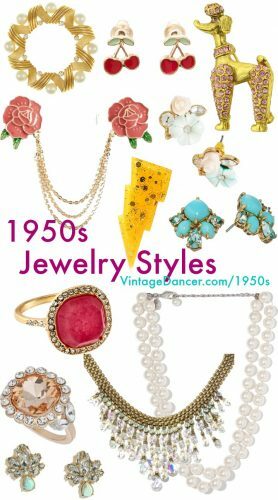 1950s jewelry is the perfect accent to your retro vintage ‘50s wardrobe. Here you will find some stunning pieces of vintage inspired and reproduction 1950s earrings, necklaces, bracelets, cocktail rings and more. Handpicked from many online retailers for their authentic vintage inspired design and affordable prices. Find rhinestone, pearl, Lucite, floral and fun novelty settings in vivid colors such as turquoise, coral, sapphire, ruby and topaz. Don’t forget a 50s brooch or set of brooches and a sweater guard to decorate your tops and a 50s pearl necklace is always a fifties classic.